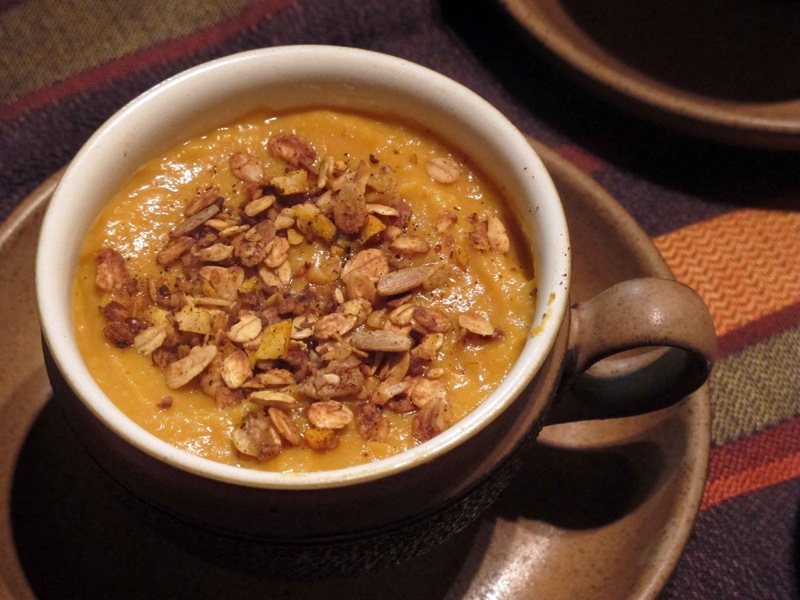 This mellow autumnal soup is enhanced by some brazil almond butter and white miso. Kashmiri chili powder provides a gentle heat. Beware of substituting it with other chili powder, you would need much less! The crunchy savoury Purebread wild oats muesli sprinkle is optional but adds a little oomph! Add the pumkin and kumara and continue to simmer for another 10 minutes. Add more chicken stock if necessary. Making wonton soup together is a great way to keep grandchildren and grandparents happily occupied for a few hours in the holidays! 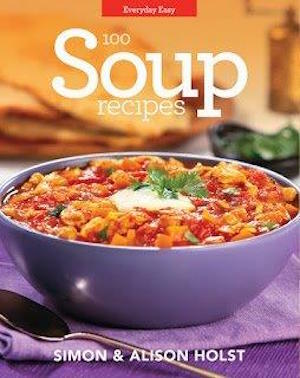 The recipe comes from Simon and Alison Holst’s latest cookbook: Everyday Easy 100 Soup Recipes. This large collection of Holst family favourites was gathered over many years. Included are golden oldies like Grandma’s farmhouse soup which used to simmer away on the back of a wood burning stove (but is easier and just as tasty made in a slow cooker today) as well as new ones which show the influence of Asian cuisine on our soup kitchen. Some come in multiple versions. There are five recipes for pumpkin, seven for lentil and eight bean soup recipes. We took a shortcut when making this soup as there were a lot of other activities we wanted to pack into the week with our granddaughters. So we used a good quality bought chicken stock instead of making our own. Mastering the art of filling and shaping the wontons wasn’t too difficult. We soon got into a rhythm and filled a baking paper lined tray ready to lower them gently into the flavoured stock. A good thing about this soup is that it can easily be adapted to different tastes. Our granddaughters all have some vegetables they like and some they hate. We finished up pleasing everyone by using just broccoli and mushrooms. The end result was bowls of tasty soup filled to the brim with wontons and vegetables, such a healthy and tasty lunch! Everyday Easy 100 Soup Recipes will be well used at our house this winter. Our granddaughters have already picked out the soups they want to try next. And that’s fine with me as you can always rely on a Holst recipe to be family friendly, reliable, inexpensive and tasty. This soup was very popular with several generations of our family. For a real treat, we would buy the wonton wrappers at a specialty Asian food store (now you can get them at most supermarkets!) then make the soup together. ➊ Put the chicken stock and thinly sliced vegetables in a large pot and set aside. ➋ In a large frying pan, heat the water, soy sauce, sherry and salt until simmering. ➌ To make the filling, mix all the filling ingredients, then divide into 32 small portions, as evenly as possible (cut mixture into 4, then 8, then 16, then 32). ➍ Place a portion of filling in the centre of a wrapper then fold in half diagonally to form a triangle. Dampen one folded corner with water. Hold folded corners between thumbs and forefingers. With one middle finger, press filled area gently so the dampened corner can be brought towards then under the other folded corner. Pinch together firmly. ➎ After you have made 4–6 wontons, drop them gently into the boiling liquid in the frying pan, jiggling the pan so they do not stick to each other or the pan. ➏ Cook for 5 minutes after liquid returns to the boil. Lift each, with a slotted spoon, into cold chicken stock when cooked. Prepare and cook the rest of the wontons, then pour the remaining liquid from the frying pan into the pot. 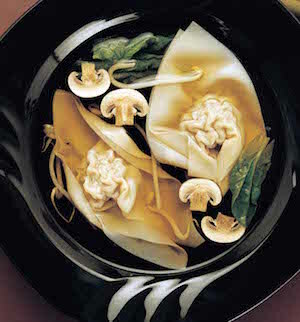 ➐ To serve, heat carefully until the wontons have just heated through, then ladle into bowls. 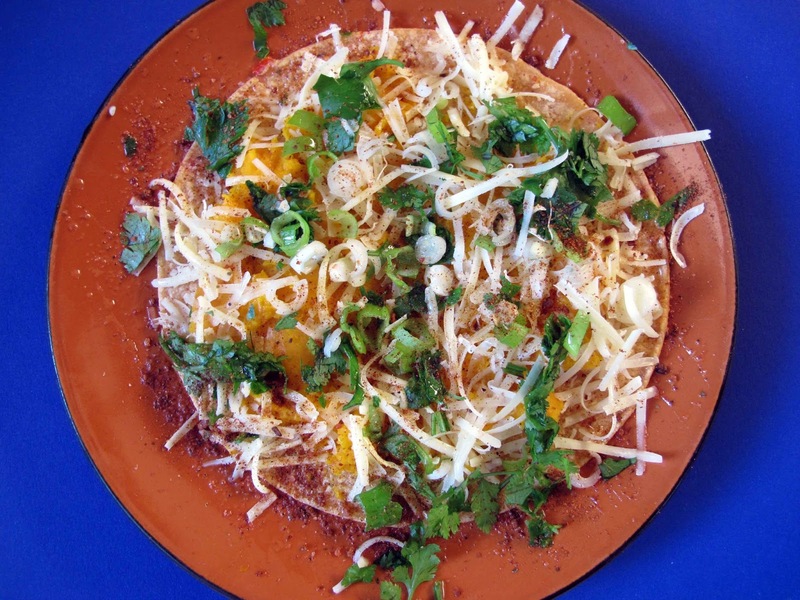 Sprinkle with chopped coriander leaves, if desired. Freeze raw chicken trimmings and giblets (except livers which make bitter stock) in a bag in the freezer, adding to the bag until it is full. Alone, or with fresh chicken backs bought specially, they make good stock, as long as other flavourings are added. ➊ Simmer chicken with everything except the salt and pepper in a very large pot for 3 hours. ➋ Strain through a sieve and discard the solids. Skim off and discard the fat from the surface. ➌ Season to taste and refrigerate for up to 2–3 days or freeze for up to 6 months. The skeleton and other remains of roast, barbecued, grilled or baked chicken may be used to make useful, small amounts of good stock. Start cooking the stock while you do the dishes, while you still have the bones, drippings and vegetable trimmings from dinner close at hand. ➊ Put all the chicken remains in a fairly large pot, with any cooking juices scraped from the original cooking pan, and any suitable vegetable trimmings. ➋ Add the ingredients listed, cover and simmer for about 2 hours. ➌ Strain off stock and refrigerate for short storage or freeze in covered containers for up to 6 months. 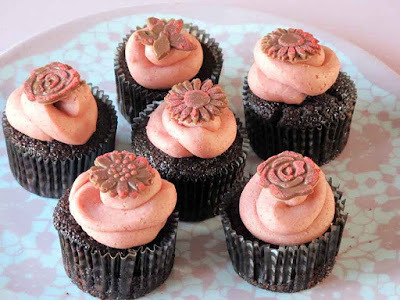 My granddaughter Susie created these amazing chocolate cupcakes, She decorated them with a swirl of buttercream icing flavoured and coloured bright pink with Fresh As freeze dried strawberry powder. The chocolate flowers were a decorative finishing touch. To make them she sprinkled some of the powder into miniature flower shaped chocolate molds before pouring in the chocolate. This was such a great holiday project and much appreciated by all of us who got to taste one! Fresh As freeze dried strawberry dried powders are all natural, and give icing a lovely fruity flavour, so good for children to use in their holiday baking. It's been a pleasure to try Tio Pablo's three new tortilla flavours: red jalapeno, green jalapeno and red chilpotle. I let my imagination roam and created these tasty recipes with them . Each one makes a great little breakfast or brunch. Before adding the topping I heated each tortilla on both sides in a hot frying pan. Dribbling a flavoured oil the tortillas before or after adding the topping was my daughter Kate's idea. I agree, it makes them more moist and flavoursome. For this I warmed a Tio Pablo Red Chilpotle tortilla for about 30 seconds on each side in a hot frypan. The finishing touch :a sprinkle of Tio Pablo Red Chilpotle salt. For this I mashed some pumpkin with finely grated ginger, smashed garlic, a splash of cream and freshly ground Himalayan rock salt and spread this mash generously onto a warmed Tio Pablo red jalapeno tortilla. 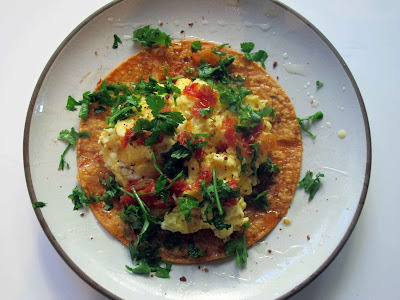 Then garnished it with shredded parmesan, chopped coriander and parsley. A sprinkle of Tio Pable red chilpotle salt was added before a final drizzle of macademia oil. This was my favourite. 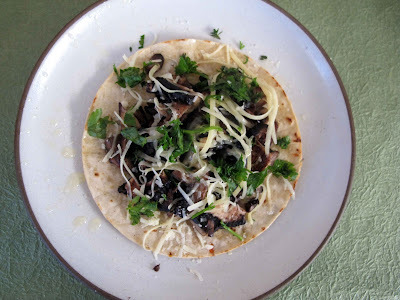 To make it I fried some portobello mushrooms and crushed garlic in a little butter and heaped these onto a Tio Pable green jalapeno tortilla. I drizzled over some hazelnut oil ( which I think really complimented the earthy flavour of the mushrooms) . Then added plenty of shredded parmesan, and a garnish of coriander and flat leaved parsley. As we all know there is more to food than taste, appearance can make all the difference. Yesterday I stewed some rhubarb and apples in a little pineapple juice with just enough sugar to take away the tartness. After letting it cool a little I whizzed it in my blender to make a smooth compote. It tasted great but it was an unappetising brown colour. Could I fix it? I had an idea. 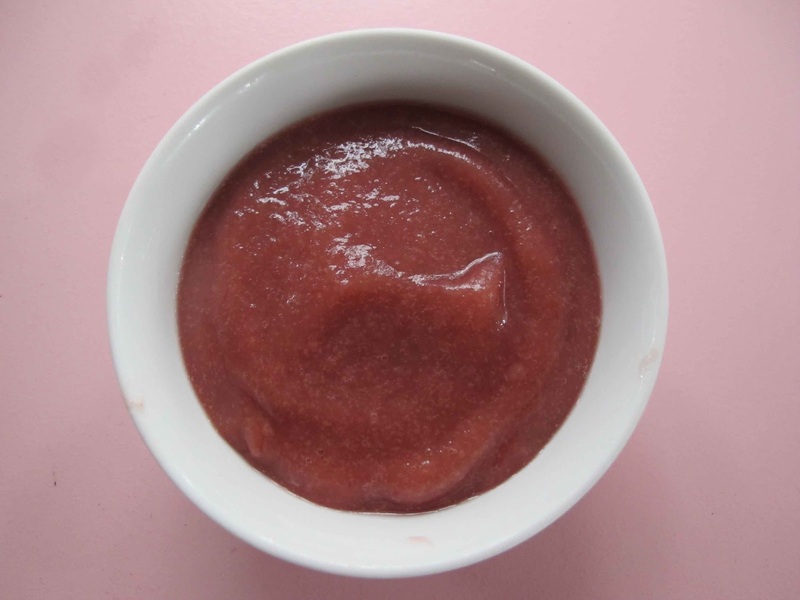 While still warm I added a teaspoonful of Fresh As freeze dried beetroot powder and it turned a fetching pink, then a little more and now it was a soft cerise red, just gorgeous. It didn't spoil the flavour at all, If anything it enhanced it. Lovely with orange juice//pear juice as well. When I whizzed my compote in a nutri bullet it became super smooth. And when I roasted the rhubarb and apples with a little orange juice and brown sugar there was very little liquid and the resulting compote was thick enough to use as a coulis with some chocolate brownies, some vanilla icecream and a wild berry sorbet.So decorative!